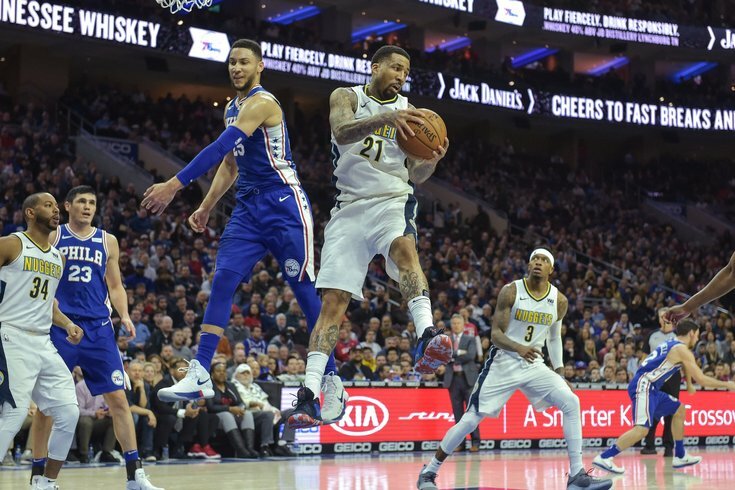 Denver Nuggets forward Wilson Chandler grabs a rebound during the second quarter of the game against the Philadelphia 76ers at the Wells Fargo Center. After striking out on the big fish in free agency this summer, the Sixers have adjusted to making smaller upgrades and loading up to take home run swings next summer. In exchange for cash considerations, Philadelphia has traded for Denver Nuggets forward Wilson Chandler, a team source confirmed to PhillyVoice on Tuesday afternoon. Trade rumblings were first reported by Shams Charania of Yahoo, then finalized by ESPN's Adrian Wojnarowski. But the most important detail of all comes from Sports Illustrated's Jake Fischer, who added details on what's coming attached to Chandler in the deal. The 76ers are acquiring Wilson Chandler, a 2021 second round pick and the rights to swap 2022 second round picks with the Nuggets for minimal cash considerations, per source. There was initial speculation that Chandler would come with a first-round pick attached, because the Nuggets are in all sorts of cap trouble at the moment. By simply getting Chandler's salary off the books, the Nuggets saw their luxury tax bill drop by almost $40 million, a massive figure for all but the richest of ownership groups. So on first glance, only getting a second rounder from a playoff-caliber Nuggets team (and the right to swap seconds) seems like a bit of an underwhelming return, particularly when you consider that Chandler's $12.8 million cap hit will take up pretty much all of Philadelphia's remaining cap space. However, there are few things to note about this exchange. Because Chandler was absorbed into Philadelphia's cap space, he's eligible to be included in future transactions immediately. This is important for the Sixers in the event they decide to strike a deal for a star. Chandler is a useful player on an expiring contract who can be used for salary matching purposes, who could end up being a useful throw-in piece for that reason alone. In other words, anybody claiming this move shuts the Sixers out of the Kawhi Leonard sweepstakes doesn't really know what they're talking about. Chandler's contract was only a problem within the context of a Nuggets team with quickly escalating salaries around him. On to the player himself! Chandler is certainly not going to move the needle a ton for Philadelphia in his early 30's, but he gives the Sixers a degree of versatility they badly needed on the wing last season. How optimistic you are about him depend on how you chose to frame it — you could say he's got a lot of tools in his toolbox, or that he's simply a jack-of-all-trades, master of none. Both would be reasonably fair assessments. Assuming he sticks, his three-point shooting will be of the most significance within Philadelphia's setup. He has been fairly consistent percentage-wise, but has generally settled into a range right below the league average. Last year his volume dropped and his percentage climbed, with Chandler knocking down 35.8 percent of his three-point shots in his last season with Denver. Parsing through the data a bit, there are signs of hope. Chandler knocked down 38.2 percent of his threes on catch-and-shoot plays with the Nuggets in 2017-18, and on a team where he's likely asked to create less and shoot more, Chandler could see his shooting numbers climb a bit. On the defensive side of the ball, Chandler might arguably provide the Sixers with a bigger upgrade than he does on offense, even though in a vacuum he probably only grades out as "solid" there. That's more of a reflection of the types of players Philadelphia had in the rotation last season — he's worlds better than Marco Belinelli has ever been, for instance, and offers the size and length for Philadelphia to run out more interesting lineups next season. One of the real shames of last season was Philadelphia not taking full advantage of Ben Simmons' lineup bending skill set. With a 6'10" point guard building block, a modern NBA team should be able to run all sorts of long, switch-heavy lineups. But because of the surrounding personnel, the Sixers often ended up boxing themselves in to more "traditional" matchups — including with their starting group. Chandler may not represent a whole lot on his own, but now the Sixers can run out lineups like Fultz-Covington-Chandler-Simmons-Embiid, or different permutations of that sort of setup. Versatility is a good thing, and Philadelphia's inability to offer many curveballs was part of what doomed them in the playoffs against Boston. Philadelphia's options to fill out the rest of the roster are minimal, but as was discussed once they brought back JJ Redick, they already have most of a rotation for next season in place. Chandler is certainly not the "missing piece" who will put them over the top, but he's a sensible fit on a movable contract who upgrades their bench on both sides of the floor. Tough to argue with that.